Power production plant operators control, operate and maintain machinery to generate electric power. Control and monitor boilers, turbines, generators and auxiliary equipment in power-generating plants. Control the flow of electricity from a central point by operating and monitoring valves, switches and gauges. 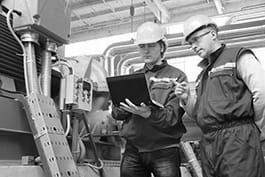 Control processes and equipment for managing by-products. Coordinate and schedule power loads and line voltages. Compile records and reports, e.g. on equipment performance, instrument readings and switching operations. Control and maintain auxiliary equipment, such as pumps, fans, compressors, condensers, feed water heaters, filters and chlorinators, to supply water, fuel, lubricants, air and auxiliary power. Clean and lubricate equipment such as generators, turbines, pumps and compressors. Communicate with systems operators, e.g. to regulate and coordinate transmission loads and frequencies, and line voltages. Start or stop generators and connect or disconnect them to and from circuits. Respond to emergencies such as fire and environmental hazards.